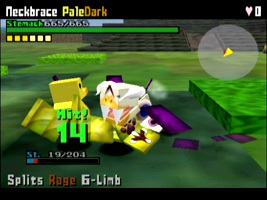 In a land populated by animals made of cubes, the Killer Cubivore sits at the top of the food chain, absorbing the "Wilderness", the essence of the land. You have to climb to the top of the food chain and overthrow the Killer Cubivore, restoring the Wilderness to the world. Your Cubivore mutates based on its color, intensity and limbs. Color determines species while intensity provides strength. Limbs are torn from other Cubivores in battle. If you take too much damage in battle, enter the Love Tunnel to produce a new generation of Cubivore with an extra limb. Any Cubivore you have acquired or bred is saved to the EZ Mutate catalogue. On the final stage, Doshin the Giant's upper-body can be seen protruding from the ground. This cameo only appears in the original Japanese version, and was removed from the U.S. version.